Software – Page 2 – India, Ink. I’m so happy for them. What happens when an e-book gets corrected? We’re writing about your past Kindle purchase of [title] by [author]. The version you received contained some errors that have been corrected. An updated version of [title] (ASIN:[ASIN]) is now available. It’s important to note that when we send you the updated version, you will no longer be able to view any highlights, bookmarks, and notes made in your current version and your furthest reading location will be lost. If you wish to receive the updated version, please reply to this email with the word “Yes” in the first line of your response. Within 2 hours of receiving the e-mail any device that has the title currently downloaded will be updated automatically if the wireless is on. You can find more information about Kindle related topics at our Kindle support site below. We apologize for any inconvenience caused and thank you for your business with Amazon. This Thursday at 12:40 p.m., I have to publicly present some sort of something about my vague and fugitive master’s thesis. The talk—about ten minutes’ worth—will be streamed online so you, my friends, can all point and laugh, and the video will be archived somewhere (hopefully somewhere dark and offline) after the event. 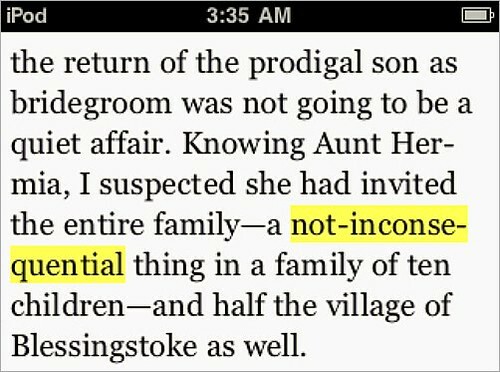 One of the things I like—a unique feature, as far as I’ve seen—about Kobo’s e-reader software for iPhone OS is that it gives you a choice between vertical scrolling and traditional pagination. 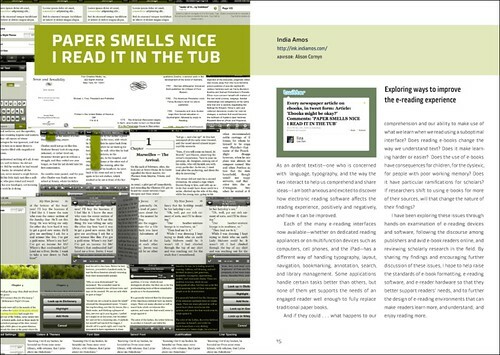 Because, really, what do pages mean on a digital reader where the text can reflow according to user preferences? Great. 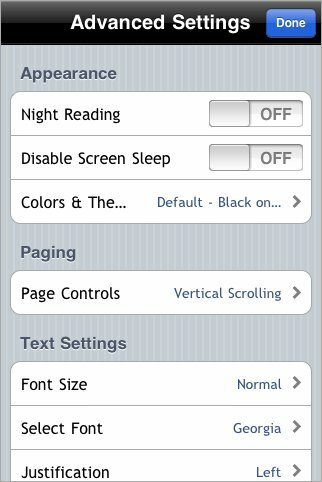 So, I selected vertical scrolling. For those of you who don’t have Illustrator CS2 (or an ancient copy of Adobe Streamline), Cathi Stevenson points out that there’s an open-source program that will convert your bitmaps to vector art: Inkscape. It’s available for Linux, Windows 2000/2003/XP, and OS X (with X11 installed—this is on the Tiger disk somewhere). I could have used this often at my last job, where I was stuck with Illustrator CS. Instead, I either e-mailed files to my personal account so I could convert them at home (if I had time) or traced them by hand (if I didn’t). Has anybody tried Inkscape besides Cathi? I’ve downloaded it but haven’t got X11 set up yet. Photo: Hand with a quill pen by Barbara Smith; some rights reserved.